African iris growing herbaceous geophyte of the genus Dietes also known as Fairy iris, African iris perennial evergreen used as ornamental drought tolerant plant and attract pollinators and can be used for cut flowers, can grow in tropics, mediterranean, desert, subtropics, temperate climate and growing in hardiness zone 8+. Flowers color can be: light purple almost white, white or yellow the flower has 6 petals in the outer circle, 3 of the petals yellow or with yellow stipe in the base, and the other 3 petals can be with brown-black dots in the base, 3 petals in the inner circle in the color purple, white, or yellow. 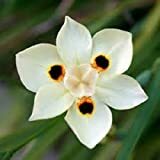 Flower has 6 petals in the outer circle color can be: light purple almost white, white or yellow, 3 of the petals yellow or with yellow stipe in the base, and the other 3 petals can be with brown-black dots in the base, 3 petals in the inner circle in the color purple, white, or yellow.